The core Breeze clientele tilts toward meat and potatoes and fried chicken, all of which are popular at the buffet and in the two main dining rooms. But foodies and vegetarians are considered, as well. The universally praised eats on the ship are found in the for-fee steakhouse and the free hamburger and pizza stands on the Lido Deck. 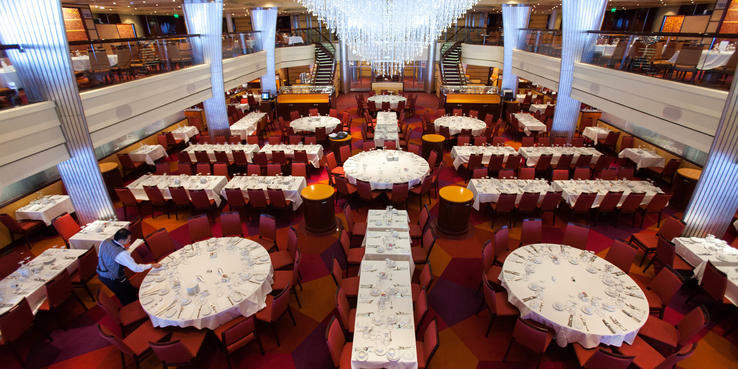 Carnival Breeze's main dining areas offer 6 p.m. and 8:15 p.m. assigned dinner seatings. Sapphire also hosts flexible dining where cruisers can arrive at any time starting at 5:45 p.m. Sapphire offers open-seating breakfast on port days, and on sea days, Blush serves lavish brunches with a bloody mary bar. Most nights feature the multicourse and surprisingly international "American Table" menu, with dishes like smoked chicken quesadillas, Vietnamese spring rolls, flat iron steak and Carnival's signature gooey warm chocolate melting cake. Quality varies -- ask your waiter for recommendations. These nights have a casual vibe (no tablecloths, for example); Carnival ups the formality on "American Table" evenings. The menu also offers "Rare Finds" (daring dishes like braised rabbit) and "Port of Call" choices to reflect regional cuisine. Order all the food you care to eat. Heart-healthy and vegetarian options are marked. A $20 surcharge is tacked onto filet mignon and lobster tail orders; there is just one free lobster night per cruise. Wine is not overpriced, and the list includes California vintages from former Carnival spokeswoman Kathie Lee Gifford. Dining room waiters are generally good at remembering names and preferences and often hop on counters (en masse) to sing and dance to upbeat pop songs. The Lido Marketplace is the casual buffet restaurant, open from morning to night, with an afternoon break for most stations (often to the chagrin of late-returning tour participants). Breakfast offers typical hot and cold morning options, including made-to-order omelets. Sandwiches, salad bar, dessert bar and a changing menu of entrees are available at lunch and dinner. Themed areas include the Comfort Kitchen (mac 'n' cheese, chicken tenders), the Deli (great sandwiches and gluten-free options), French Chef and Mongolian Wok (choose veggies and meat for a custom stir-fry). There's also 24-hour soft serve ice cream and frozen yogurt machines. On days at sea, the buffet complex feels like a big high school cafeteria at lunch hour, with long waits. At night, it's the place to go to avoid the dress code. At Carnival's version of Chipotle, you can build your own burrito or taco with meats, cheeses, peppers and beans. A salsa bar provides ample toppings. At breakfast, BlueIguana Cantina offers scrambled eggs, sausages and more wrapped into a burrito. Fork up the greatest hits of Indian cuisine at this authentic mini-eatery that's rarely crowded and tucked away at the back, near the quieter of the Lido Deck's two pools. If you don't like spice, Tandoor is not for you. Food Network star Guy Fieri's burger counter is very popular; it's open daily from noon to 6 p.m., but you'll wait if you come at peak hours. Order from the menu (including options made with bacon patties) or get a regular hamburger or cheeseburger and dress it up at the self-serve toppings bar. Don't miss the hand-cut fries. You can special order less well done or vegetarian patties. This 24-hour stand bakes pies to order, so be prepared to wait for warm, thin-crusted pizzas that are melt-in-your-mouth delicious. Another Guy Fieri creation, Guy's Pig & Anchor Bar-B-Que Smokehouse is the place to go for decadent barbecue and indulgent sides like mac 'n' cheese, coleslaw, baked beans and potato salad. This old-school hot dog cart appeals to the kid in all of us but is only open sporadically on the sports deck by the mini-golf course. Continental breakfast, basic sandwiches and desserts are complimentary. You'll pay extra for items like sushi, crispy chicken tenders and "authentic Philly cheesesteak," though all are $6 or less. Personal pan pizzas (not as good as the pies baked on deck) are $5. Delivery times vary. The "it" place onboard for foodies, the Chef's Table features a set seven-course tasting menu in Breeze's giant galley. Here, the executive chef shows off cuisine you might expect at the world's costliest restaurants to an intimate group of 12.Cost includes wines. Reservations far in advance are essential, as The Chef's Table usually sells out. Ready for green eggs and ham? Or a colorful stack of hotcakes? Oh, yes, I am. The whimsical meal with costumed Seuss characters, including The Cat in the Hat, takes place at least once per cruise on a sea day. Open from 7 a.m. to midnight daily, this is the ship's Starbucks. Grab a latte and a giant hunk of Black Forest cake (extra fees apply). Ice cream and spiked coffee drinks also are sold. This contemporary Japanese eatery serves up sushi and sashimi, as well as miso soup, bento boxes and sake. No reservations required. Bonsai Sushi is open 5 p.m. to midnight. Book early for the most popular specialty dining venue on Carnival Breeze. This steakhouse is the place for meat- and seafood-lovers, and those looking for date night in an intimate, dimly lit setting. Quality is better than similar items you'd find in the main dining rooms. In addition to its liquid libations, you'll find small-plate Caribbean-inspired pub grub after 6 p.m. at RedFrog Pub. This homey trattoria with red-checked tablecloths serves Italian favorites. During dinner at Cucina del Capitano, expect to be serenaded by singing, dancing servers. Reservations are suggested. At lunch, there's a free pasta bar.